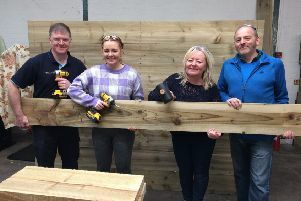 Volunteers with the Bonnybridge Outdoor Sport Association were delighted to be able to lay down a path to ease community access alongside an artificial turf pitch at Bonnybridge Community Education Centre, thanks to the help of council members and DJT Landscapes. Charlie MacVicar, treasurer of the Bonnybridge Outdoor Sport Association, said: “We look after the artificial pitch, pay for repairs and the upkeep of the premises, and have done so for 25 years now. “We are able to do work like this new footpath for the community to have easy access. I would like to thank Mark Meechan, community learning and development manager at Falkirk Council, for his help, David Tonner of DJT Landscapes for the excellent work laying the new path, and councillor David Grant for his hard work. The association has made many improvements to the site over recent years including bike parking and litter bins.